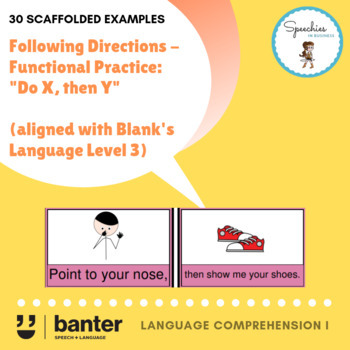 Following Directions - Functional Practice: "Do X, then Y"
Some researchers think that up to 15% of young school kids don’t have the language comprehension skills to cope fully with the demands of school (Hart & Fielding-Barnsley, 2009). One area in which many kids struggle is with following directions or instructions. The ability to follow multi-step instructions is a big advantage. It helps to carry out learning activities and to succeed in tests. It can make you seem more diligent and responsible (especially to teachers and peers). And it can help you to navigate to new places and to deal with new situations. Many children and adults struggle to follow multi-step instructions, including many people with developmental language disorders and working memory issues. Following long instructions requires you to hold all the detailed content of the sequence while monitoring yourself carrying them out at the same time. Many teachers and speech pathologists practice directions with "point to the X" type of activities. These activities can be helpful when working on vocabulary and language concepts. But a more functional approach is to ask kids to remember the later steps while they attend to earlier steps "in the real world". When the time needed to complete the instructions exceeds the duration of your working memory, you have to actively maintain the instructions in your working memory, e.g. by rehearsal (retelling yourself the instruction out loud or “in your head”, over and over) (e.g. Camos et al., 2009). This simple pack includes lots of two-step directions linked by "then" that kids have to act out in the real world. For some kids, simply reading out the instructions will suffice. For students with more significant delays and disorders, picture cues are included. These instructions align with Blank's Language Level 3, where children are required to look beyond what they see, hear and touch directly, and must rework the experience in accordance with the language demands of the task. These instructions can be "mixed and matched" to generate thousands of different two step instructions. Cut up the cue cards to have students generate their own instructions for peers to practice giving instructions. For evidence-based information about following directions, check out our article: Following instructions: why so many of us struggle with more than one step. For more information about Blank's Language levels, check out our article: “Huh? !” The many benefits of using Blank’s Language Levels framework to help your kids to understand language for school.